In large bowl, mix tomato paste, soy sauce and brown sugar. Stir in broth; set aside. Rub beef with grill seasoning and salt. In 5-quart Dutch oven, heat 1 tablespoon of the oil over medium-high heat. Cook beef in oil 2 to 3 minutes on four sides or until browned. Transfer beef to plate. Add remaining 1 tablespoon oil, then add onion. Cook 2 to 3 minutes, stirring constantly, until softened. Add potatoes, carrots and beef. Pour broth mixture over beef mixture. Heat to boiling. Cover; reduce heat to medium-low. Simmer 1 hour to 1 hour 30 minutes or until potatoes are tender. Remove potatoes to plate; cover tightly with foil. Increase heat to medium-high; uncover Dutch oven. Cook 8 to 12 minutes, stirring frequently, until sauce thickens. Serve beef with potatoes, carrots and sauce. Top with parsley and thyme. Leftover beef and sauce make an excellent pulled beef sandwich for lunch the next day. Two- to three-inch fingerling potatoes make a fun substitute for the baby red potatoes. Whether or not searing the meat before slow cooking is a necessary step has been a long-standing debate, and while it may not be necessary, it’s definitely worth the extra effort. No matter where you stand on the issue, there is an undeniable savory flavor that comes from searing your meat before slow cooking. 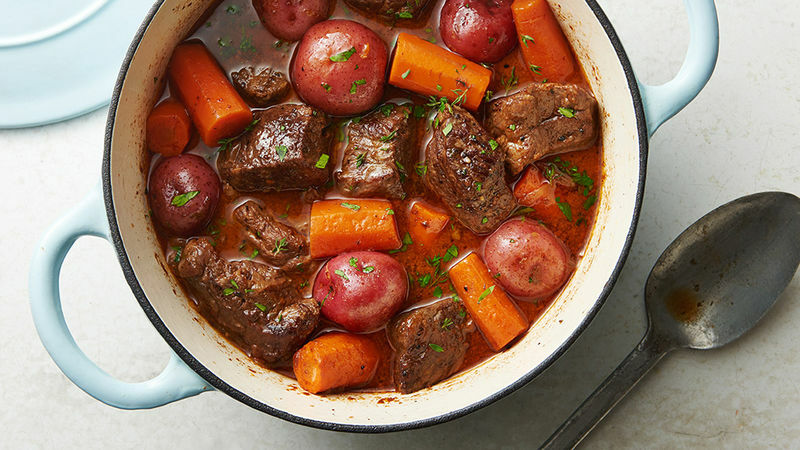 Try it once and we promise you’ll never be tempted to overlook this additional step ever again, whether you’re making pot roast, beef stew or any other Dutch Oven recipe.